Would You Vote to Reelect This Republican? He has the second worst HRA (House Republican Alliance) score of all Republicans. His attendance record is fourth worst. 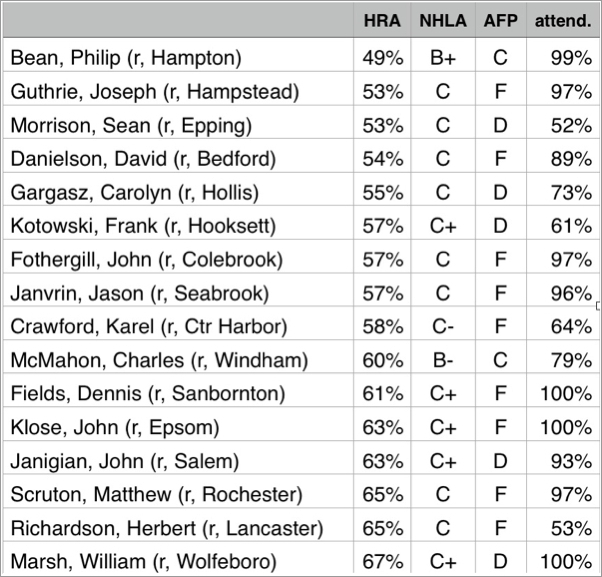 His NHLA (New Hampshire Liberty Alliance) score would be in the bottom 10% but he was given an “Incomplete” due to his bad attendance. His AFP (Americans for Prosperity) score was a “D”. Or how about this Republican? She has the worst HRA score of all Republicans and the worst NHLA score. She earned an “F” from AFP. Her attendance is in the bottom 20% of all legislators. The good news is that you won’t have to. Those two Reps decided not to run again. The bad news is that there are many other Republicans with terrible voting records who are running again. Without your help these candidates probably will be reelected despite their terrible records. They have good name recognition and are well liked in their communities. Most voters have no information about their Reps’ voting records. But isn’t voting the number one job of a State Rep? Shouldn’t they be judged on the basis of how well they do their job? If your neighbors knew about their Reps’ bad voting records, wouldn’t they vote for someone who would vote better? Our best and perhaps only chance to defeat these entrenched candidates and replace them with people who will vote better (and wouldn’t almost anyone vote better?) is to get information to voters. And the best and often only way to reach voters is by word of mouth. If you contact friends and neighbors and tell them about their Reps’ terrible voting records, and if they do the same, then we can elect much better Republicans. Please help us spread the word about these 16 candidates’ terrible voting records. P.S. We can’t beat someone with no one. Please help us find opponents for these terrible candidates or please consider running yourself.